With its Cape Dutch architecture, mountain-fringed setting, famous university and a line-up of wineries that reads like a who’s who of the South African industry, Stellenbosch is one of the world’s great wine centres and the undisputed heart of the Winelands. This is the second oldest town in South Africa after Cape Town, having been founded in 1679 by Governor Simon van der Stel, who modestly named the place after himself, and still retains much of its colonial feel. Afrikaners sometimes refer to Stellenbosch as ‘Eikestad’, in honour of the three hundred year old oaks that line its beautiful streets. But it is wine, not trees, that has made Stellenbosch famous. Tourists come here in their tens of thousands to follow the Stellenbosch wine route, or rather routes, since the area’s 173 cellars are hard to visit in a month, let alone a week. There are five routes in all: Greater Simonsberg, Stellenbosch Berg, Helderberg, Stellenbosch Hills and Bottelary Hills (see here for more information). The things that attracted van der Stel in the 1600s still make Stellenbosch an ideal place for growing grapes. The town is situated in the fertile Jonkershoek River Valley and is blessed with a mild Mediterranean climate, rainy winters (annual rainfall is 600 to 800mm) and long, hot dry summers and autumns. The Eerste River still flows through the centre of Stellenbosch and into the sea at False Bay, 14 miles away. The ocean influence can be marked in some areas of Stellenbosch. The Stellenbosch mountains, which are part of a range that runs southwards to Agulhas at the tip of Africa, form a spectacularly craggy backdrop to the town as well as providing winemakers with slopes on which to plant vineyards. 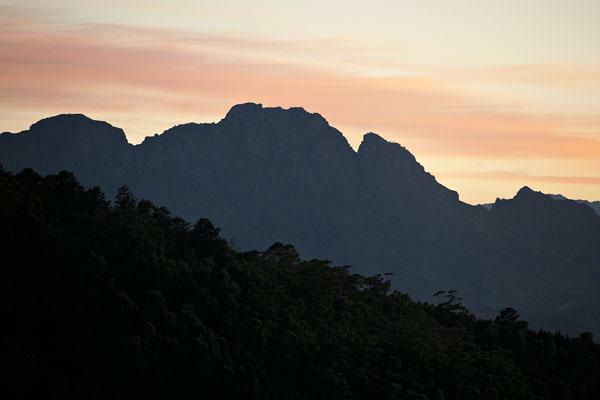 Thanks to those mountains, Stellenbosch has one of the most beautiful settings in the world. The autumn sunsets, when the cliffs are dappled in fading pink and orange light, are worth travelling thousands of miles to see. According to people who know about these things, there are as many as 50 different soil types in Stellenbosch. One expert describes the mix as ‘red and yellow-brown Tukulu and Oakleaf, structured Swartland and Klapmuts and duplex Kroonstad’, which probably means as much, or as little, to you as it does to me. The local Platter guide offers a more approachable generalisation – ‘acid, decomposed granite in the mountainside vineyards and alluvial soils on clay bases in the valleys’ – but adds that Stellenbosch has a ‘bewildering variety of terroirs, from very hot to sea- or mountain-moderated’. Stellenbosch is sometimes called ‘the Cape’s answer to the Napa Valley’, a comparison that can be interpreted in several different ways. The power base of the industry resides here for a start. As well as producing many of the country’s best wines, Stellenbosch is home to several of South Africa’s biggest wine companies, including Distell, The Company of Wine People and Winecorp. So does the money, both old and new. Examples of established estates include Meerlust, Rustenberg, Thelema, Rust en Vrede, Simonsig, Warwick, Kanonkop, Vergelegen and Delheim, while more recent, cash-rich set-ups, are Ernie Els (yes, that Ernie Els), Tokara, Morgenster, Waterford, Laurensford, De Toren and Quoin Rock. Administratively, the district of Stellenbosch is divided into six separate areas, known as wards. These are Jonkershoek Valley, Papegaaiberg, Simonsberg-Stellenbosch, Banghoek, Bottelary and Devon Valley. Other parts of the district that do not have their own appellations include the Helderberg, which is strange given the quality of the wines produced there. These different areas are grouped around the town of Stellenbosch like an applauding audience: Devon Valley and Papegaaiberg to the west, Bottelary to the north-west, Jonkershoek and Banghoek to the east, Helderberg to the south and Simonsberg-Stellenbosch to the north-east on the foothills of the Simonsberg Mountain (see my photo of its slopes at dawn). If this all sounds rather complicated, it’s much easier to get your bearings on the ground. Once you recognise the shapes of the different mountains (Simonsberg, Jonkershoek, Hottentots Holland, Stellenboschberg and Helderberg) finding your way around is simple. There are also hundreds of sign posts to help you on your way. Stellenbosch is generally thought of a red wine-producing area that specialises in Bordeaux style blends – that is to say wines made from a combination of Cabernet Sauvignon, Merlot, Cabernet Franc and occasionally a little Petit Verdot. With these varieties, it’s certainly true that the area makes some of the Cape’s best reds (Vergelegen, Tokara, Delaire, Reyneke, Rust en Vrede, Hartenberg, Le Riche, Rustenberg, Warwick, De Toren, Stark-Condé and Thelema are all very good to outstanding wineries) but the region is considerably more diverse than that. Different parts of Stellenbosch are suited to a range of other varieties. Apart from the Bordeaux red grapes, Pinotage, Shiraz, Chenin Blanc, Chardonnay and Sauvignon Blanc all do well here. Closer to the sea, near False Bay, you can even find some good examples of Riesling and Gewürztraminer. You can also find the odd sparkling wine, as well as fortified and dessert styles. In other words, Stellenbosch can turn its hand to almost anything, with the possible exception of Pinot Noir, a grape that struggles almost everywhere in South Africa but Walker Bay and Elgin. Yet even this most fickle of varieties is showing promise at Vriesenhof under the strict tutelage of former Springbok rugby player, Jan Boland Coetzee. In your desire to taste more structured reds, you certainly shouldn’t overlook the whites made by the likes of DeMorgenzon, Neil Ellis, Thelema, Tokara, Kanu, Rudera, Vergelegen, Mulderbosch, Ken Forrester, Raats Family and Reyneke. Stellenbosch accounts for around 17% of South Africa’s area under vine (with 16,827ha out of 100,569 hectares), but it garners more than its share of awards and column inches. The region is not quite as all conquering as it once was, partly because of increasingly sharp-toothed competition from areas such as Paarl, Swartland, Tulbagh, Elgin, Elim, Hermanus, Franschhoek and Cederberg, but it still makes a significant percentage of the Cape’s best wines. Cheaper wines aren’t really Stellenbosch’s forte, given the price of land, the comparatively low yields and the proximity to Stellenbosch, but even here the region scores with wines from the likes of Ken Forrester, Kleine Zalze, Spier, Villiera, Clos Malverne and Beyerskloof. It’s possibly not a coincidence that two of these producers run very good restaurants in an area that is not short of good eateries. Ken Forrester’s 96 Winery Road (00 27 21 842 2020) and Kleine Zalze’s Terroir (00 27 21 880 8167) are both excellent places to relax and drink a few good bottles. But if it’s fine dining you want (as well as a winery that looks like something from out of a James Bond film), my tip is Tokara (00 27 21 808 5959) on the painterly Helshoogte Pass. Who are my favourite Stellenbosch producers? It’s not easy to come up with a short list in an area with so many star names, but if I had to pick a dozen (in alphabetical order) they would be Delaire, Kanonkop, Le Riche, Meerlust, Raats, Reyneke, Stark-Condé, Thelema, Tokara, Vergelegen. Warwick and Waterford. There’s a nice link between Vergelegen and the early days of the Cape. This historic estate was established in 1700 and belonged to Adrian van der Stel, son of Simon, until he was called back to the Netherlands in disgrace. Today, the estate has a very different personality at the winemaking helm. André van Rensburg makes two of the Cape’s top wines (Vergelegen V and Vergelegen White) and a number that aren’t far behind. To the occasional annoyance of his employers, Anglo-American, Van Rensburg speaks his considerable mind. Some of his more outrageous comments are unprintable, but he’s one hell of a winemaker too. It’s only a hunch, but I think the van der Stels, father and son, would have enjoyed his company.